Here’s where all my obsessive craft hoarding is coming in handy. I’ve had that zipper sitting in a drawer for probably about 5 years. Didn’t even know it was there (along with some purse handles). I just went digging in another drawer and found a brand new pack of snap closures. I’m excited (and afraid) for what I’ll find on my next search. I think next up for me and Buster the wonder machine will be a needle book….then pizza…then an ipod cozy…rounded out by an online game of Super Mario Kart Wii with my brother and my cousin. Laziest day ever? YUP! **AWESOME tutorial for the little pouch above can be found here at three bears blog. 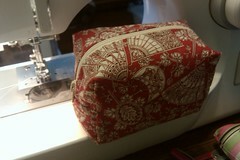 This entry was posted in sewing and tagged bag, sewing, tutorial. Bookmark the permalink.